Did you miss - SUMMER SEASON AUDITIONS?!?! Still want to be involved? We are always looking for help around and behind the scenes! Each of these short and delightful plays are being directed by a different Enter Stage Right Company Participant. The world according to David Ives is a very odd place, and his plays constitute a virtual stress test of the English language -- and of the audience's capacity for disorientation and delight. Ives's characters plunge into black holes called "Philadelphias," where the simplest desires are hilariously thwarted. Chimps named Milton, Swift, and Kafka are locked in a room and made to re-create Hamlet. And a con man peddles courses in a dubious language in which "hello" translates as "velcro" and "fraud" comes out as "freud." A comedic play about Ethel P. Savage, an elderly woman whose husband recently died and left her approximately ten million dollars. Contrasting the kindness and loyalty of psychiatric patients with the avarice and vanity of "respectable" public figures, it calls into question conventional definitions of sanity while lampooning celebrity culture. We're excited to present one of Shakespeare’s best known comedies for our Annual Will on the Water Summer Shakespeare 2017! 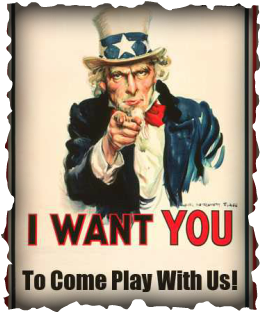 Here at Enter Stage Right, we want you to come play with us! ​Contact Regina at (810) 334-6415 or at esrtheatre@gmail.com to get started!